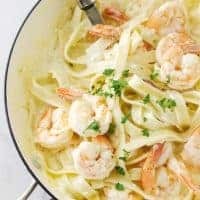 For all the busy mom’s that need a delicious, ‘on the table in minutes’ meal at the end of the day, this Creamy Garlic Butter Shrimp Pasta is for you! This simple pasta recipe hits all the right notes. 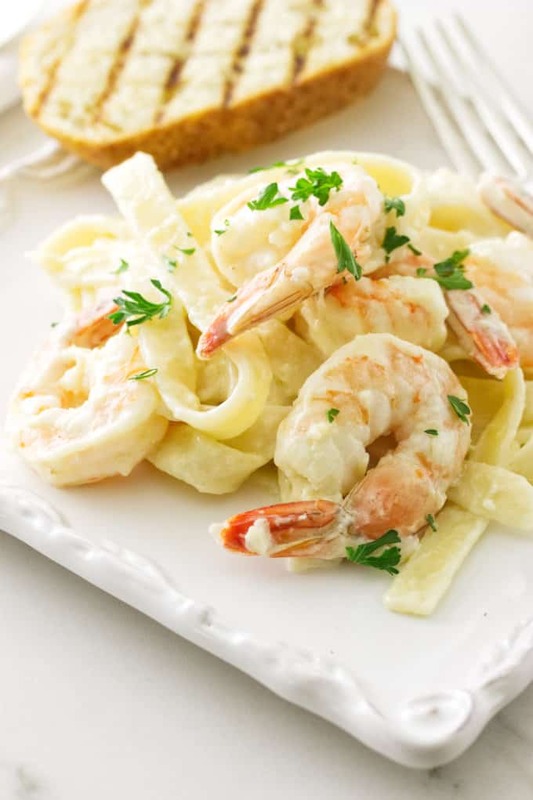 Sweet succulent shrimp, immersed in a creamy garlicky sauce and tossed with thick strands of fettuccine pasta. Plus delicious and quick, start to finish thirty minutes max. Yes, this quick pasta recipe is seriously easy to prepare. All you need to add to complete the meal is to toss a green salad together and grill or toast a few crusty bread slices of sourdough bread. We are always looking for a great-tasting pasta dish that is quick and easy. 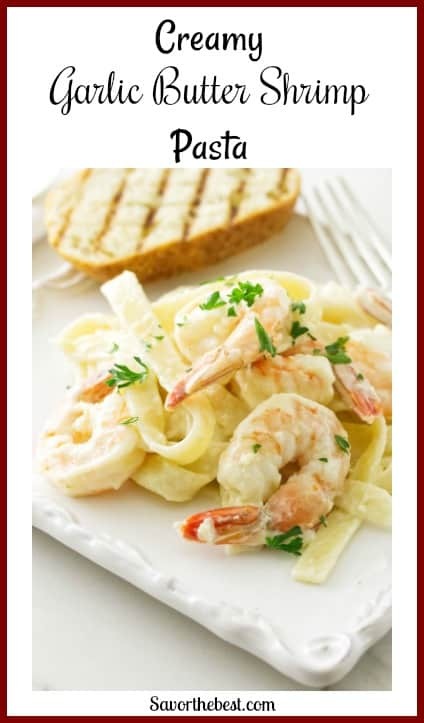 With this recipe you will be able cook the shrimp and prepare the sauce in about the time the water boils and the pasta cooks. That is, if you are using thawed and cleaned shrimp. 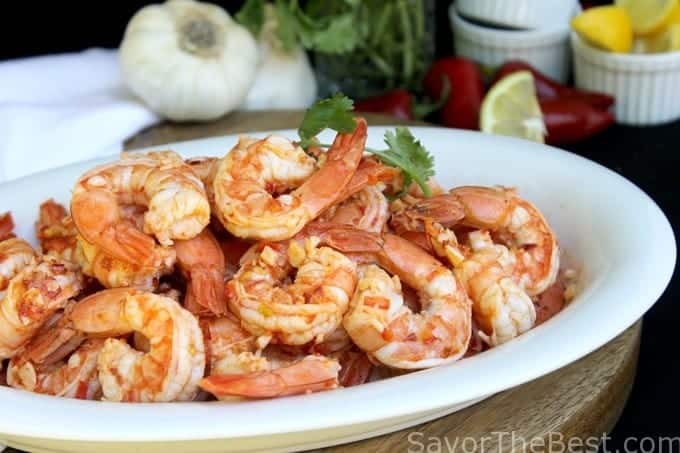 If you are using frozen shrimp it is going to add at least another fifteen minutes. Shrimp are highly perishable so as soon as they are netted and brought aboard the shrimp boats they are flash frozen. Right there on the shrimp boat. How often do you buy the fresh shrimp under the fishmongers glass case? Actually, it has been frozen and thawed out. A better buy is in the glass case of the freezer section. We like to buy a bag frozen medium-size shrimp, cleaned with the tails still on. 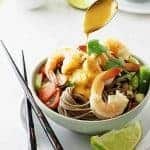 Shrimp are always in our freezer for a fast stir-fry or salad at the spur of the moment. Lift the colander out of the water and refill the basin with cold water again. Add the colander of shrimp back into the basin for another 10 minutes and they should be thawed out. Gently shake the colander of shrimp to drain the water from them and tip them out onto a kitchen towel. Pat them with paper towels to remove as much of the water as possible before cooking. Although your microwave has a defrost setting on it, do not thaw the shrimp in the microwave. 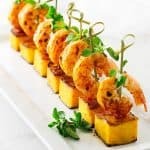 Shrimp cook quickly and microwaves are not dependable for thawing shrimp evenly. First, we put a pot of salted water on to boil for the pasta and while it was heating up, then we added the pasta. Meanwhile, we cooked the shrimp in a large skillet with butter and lemon juice. We transferred the shrimp and those good juices to a plate and it was set aside while we prepared the sauce. While the pasta cooked we added the grated garlic, olive oil and butter to the same skillet and cooked the garlic until it was soft and very fragrant. Next, we sprinkled the garlic with flour, stirred and cooked it blending it into a paste. A little wine, a little chicken broth and some heavy cream went into the skillet and it cooked into a creamy sauce. Some seasoning and a pinch of red pepper flakes gave the sauce a bit of a zing. 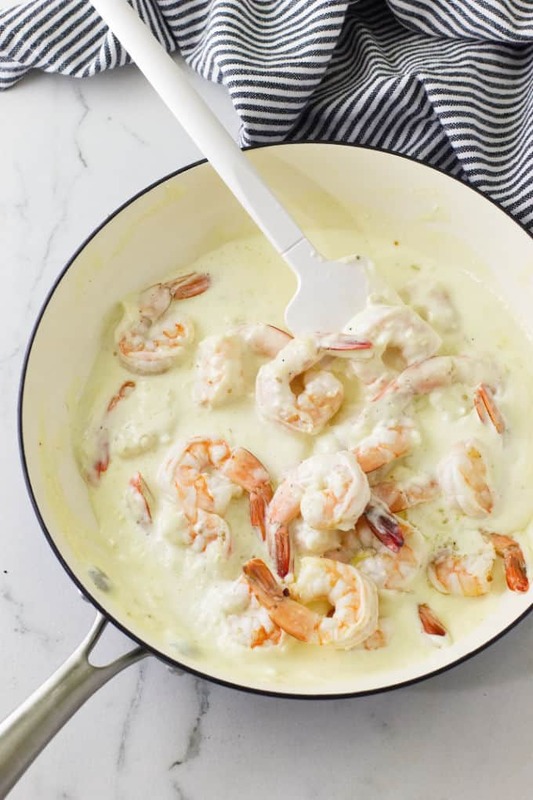 Off the heat, we added the reserved cooked shrimp, plus the flavor-packed liquid to the hot, creamy sauce in the skillet. With the shrimp submerged in the sauce for a couple minutes, they finished cooking. By that time the pasta had finished cooking we drained it and tossed it in with the shrimp and sauce. Our creamy garlic butter shrimp pasta was ready to garnish and devour. What kind of wine should I use for the sauce? 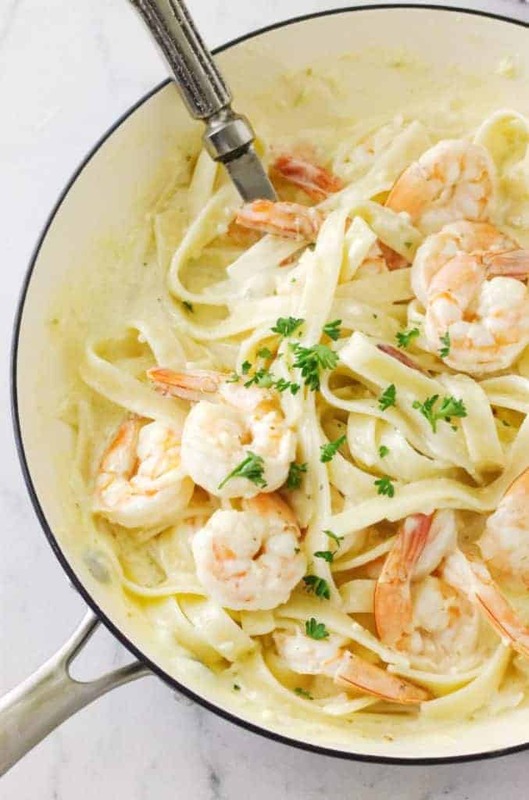 This creamy garlic butter shrimp pasta has wine in the sauce. Don’t worry about the alcohol, it will cook out and leave only the flavor. We recommend a nice dry wine for this recipe. If you like sweet wine then save the sweet wine to drink with your meal but add a dry wine to the sauce. 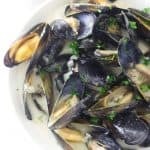 We used a Sauvignon Blanc but a Chardonnay or Pinot Grigio would also be excellent in this recipe. Shrimp cook very quickly. Even jumbo-sized shrimp will cook in a few minutes and can easily be overcooked. The great thing about shrimp is that they will tell you when they are done. You just have to know the signs they are sending. Raw shrimp will be a bit grey and if you hold them up to the light you can kind of see the light shine through their flesh. They will flop and sag when you hold them by their tails. When I say sag, they will almost be straight. Once the shrimp are cooked, the flesh becomes white with streaks of pink. But the most important thing to look for is their shape. Remember when we mentioned above that the raw shrimp will sag and almost be straight when you hold it by its tail? Well, a cooked shrimp will curl into a ‘C’ shape. The tighter the shrimp curl, the more ‘cooked’ they will be. 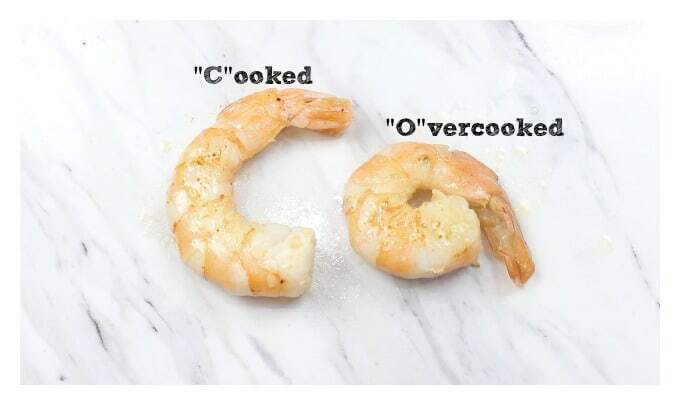 If you cook the shrimp so that the “C” closes into an “O” then you have cooked them too long and they will become tough and chewy. So if you want nice tender shrimp, cook them until they form a ‘C’. Think of it this way. “C” is for “cooked” and “O” is for “overcooked”. The photo below gives a much better example of what I am explaining. You will see that both of the shrimp are the same color but they are not the same shape. As you continue to cook the shrimp, it curls up in a tight little circle. Perfectly cooked shrimp next to overcooked shrimp. Some shrimp, especially the smaller ones will already be in a nice little “C” before they are cooked. In that case, you need to pay close attention to the color of the shrimp as it cooks. As soon as it gets that pretty pink and white color, think about taking it off the heat. Don’t worry about undercooking it. It will continue to cook even after you take it off the stove. Plus, in a recipe like this, you put it back in the hot creamy garlic sauce which will cook it even further. These Firecracker Shrimp are hot and spicy and full of flavor! 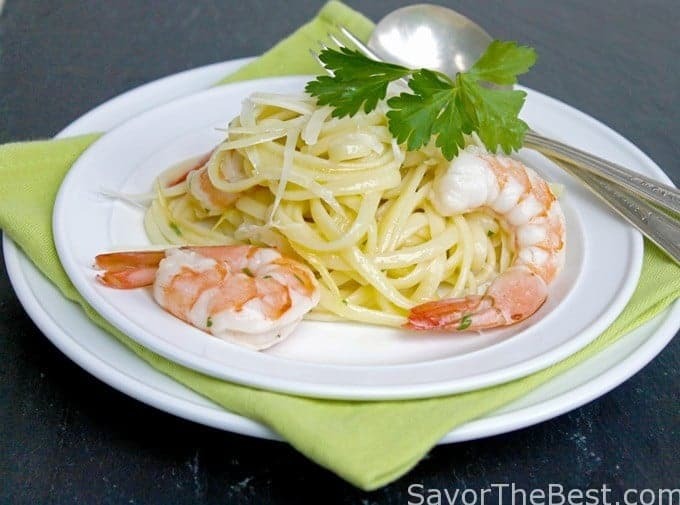 This Lemon Garlic Shrimp Linguine is so easy and only takes 15 minutes to cook. 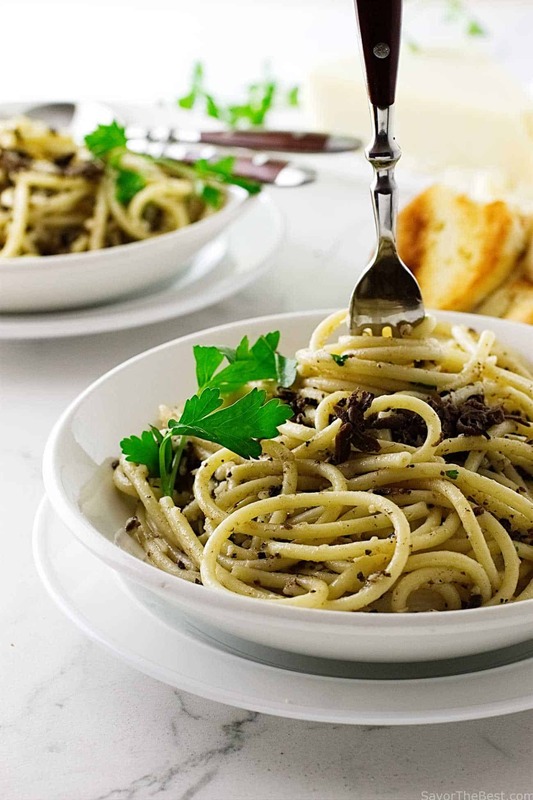 These Pasta Strands with Black Truffle Sauce is perfect for a romantic dinner. And if you’re looking for some great uses for garlic try this simple garlic butter sauce. We love dipping our bread in this stuff!! Or slather a roast beef sandwich with this creamy Lebanese Garlic Sauce. It is simply amazing!! 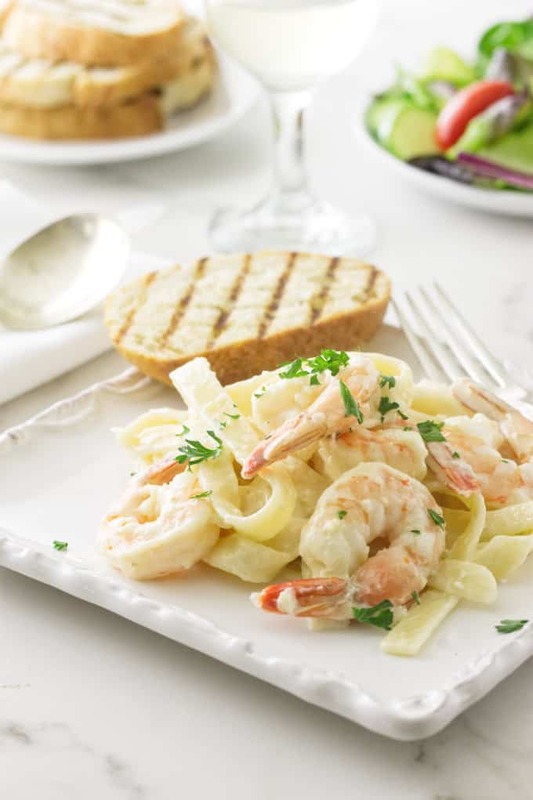 Check out our video and see just how easy it is to prepare this creamy garlic butter shrimp pasta. You will have it on the dinner table in no time. Bring a large pot of salted water to a boil over high heat. Add the pasta and cook according to the manufactures directions. Cook until almost tender but firm (al-dente). Drain the pasta and return it to the cooking pot. Place a lid on it so it stays warm. While the pasta is cooking, Put the shrimp in a plate and pat them dry with paper towels, then sprinkle lightly with sea salt. 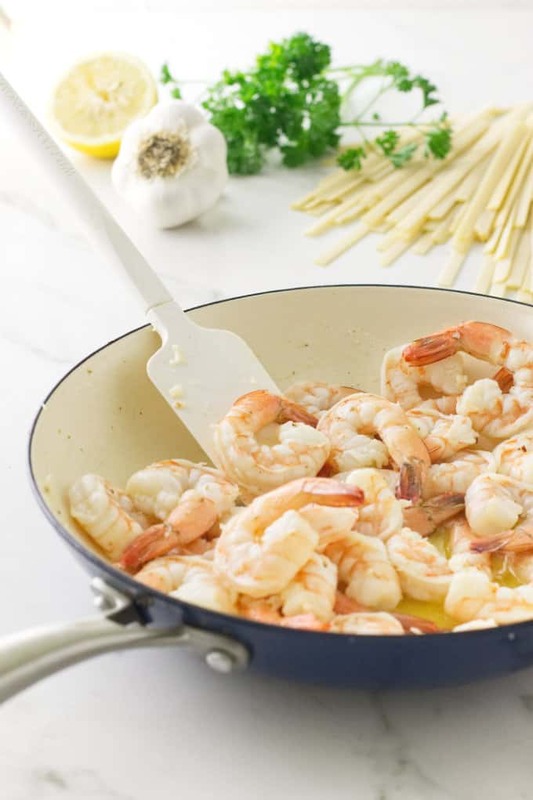 Add 2 tablespoons of the butter to a large skillet set over medium-high heat and when it has melted, add the shrimp and the lemon juice. Cook the shrimp just until it begins to turn pink. Do not overcook the shrimp. It will continue to cook after it has been added to the sauce. Remove from the heat, and transfer the shrimp and the liquid remaining in the skillet to a bowl and reserve. Add the other 2 tablespoons of butter and olive oil to the skillet set over medium heat. When the butter has melted add the garlic. Cook and stir for a minute or so until the garlic has softened and very fragrant. Do not brown the garlic. Sprinkle the flour over the garlic and continue to cook for another 1 or 1-1/2 minutes to cook the flour. Whisk in the chicken stock and the wine. Stir to combine, then add the cream. Season with salt, pepper and the red pepper flakes. Bring the sauce to a boil, then reduce the heat to low and simmer for 2 minutes, whisking frequently. Remove the sauce from the heat and add the reserved shrimp and their juices in the dish, submerge the shrimp into the hot sauce to heat through for a minute or two. Add the drained, warm pasta to the sauce and toss to combine. Transfer to a serving bowl, sprinkle with the grated parmesan cheese and garnish with chopped parsley. Any pasta will work in this creamy sauce. To keep the pasta from drying out and sticking together after it is drained, add a drizzle of olive oil and toss. We used the medium size shrimp 21 to 25 per pound with tail on. Thawed frozen shrimp may be used. To quick-thaw shrimp in 15-20 minutes, place the shrimp in a colander and immerse in a basin of cold water. Remove and drain, then tip them out on a kitchen towel or a thick pad of paper towels and pat dry. Shrimp cook quickly, the shrimp will lose it's gray color and begin turning pink within one minute or so. Continue to toss while it is cooking. Some of the shrimp will turn pink more quickly than others, remove and set them on a plate. A roux of flour will thicken the sauce slightly and give it body for the sauce to cling to the pasta. A sweet white wine is not recommended for this recipe. We used a nice Sauvignon Blanc but Chardonnay or a Pinot Grigio will be excellent. The wine and chicken stock add flavor with limited calories and less heavy cream is required. Add the cooked shrimp to the hot sauce, submerge them for 1 or 2 minutes to reheat before adding the pasta. Shrimp play so well with garlic. Add a little cream to the mix, and I’m in heaven. Good looking dish — thanks.